One hot Missouri June when my children were very young, we decorated our front porch with a large white container of flowering impatiens. The pink and red petals with deep foliage cheered our doorstep. At the time, I knew that impatiens needed shade, but I hoped they would thrive in the full sun like other people’s front-porch flowers. We closed the door and walked inside. Anyone who knows about shade-loving plants knows what happened next. Over the next few days in our blazing Midwest sun, blossoms shriveled. Foliage burned. Sobered, I carried those flowers to our shaded backyard. Few would see them now, but maybe we would witness the plants’ return to life from our family’s backyard swing. As I was raising my young children, local playgroup friends talked about their able-minded children who earned ribbons, juggled extracurricular activities, and made good grades. I already knew my experience was not like theirs. In the afternoons after our homeschooling lessons, my children played in the backyard pretending to be Henry and Violet from The Boxcar Children in the large wooden box my husband nailed to a tree. They collected eastern tent caterpillars in glass jars. They learned, with much practice, how to have conversations. Like the impatiens, my children thrived in the sheltered retreat of our backyard. My children did not attend a different scheduled activity every day. My daughter, especially, seemed to need far more attention, supervision, and protection than most children. She also required specialized therapies, physicians, and extra help to learn. Sometimes we pushed our young children more than we should have, and invariably we then witnessed dangerous or odd behaviors such as wandering, nightmares, playing with matches, and even eating laundry detergent. I did not know much, but I knew that our children would not thrive in the bright hot sun of excessive rigor, complex social demands, and overbearing pressures. To this day, the memory of those pink and red petals guards me against overtaxing my children. It also enlivens my desire to provide a beautiful, incremental, and purposefully gentle education for all children with challenges. 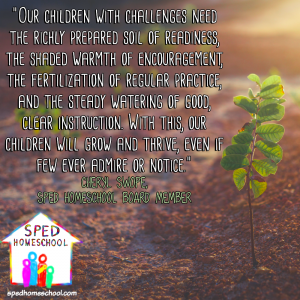 Our children with challenges need the richly prepared soil of readiness, the shaded warmth of encouragement, the fertilization of regular practice, and the steady watering of good, clear instruction. With this, our children will grow and thrive, even if few ever admire or notice. Over the past twenty years or so, two sisters from that first playgroup furnished a similar lesson for me. One spunky little girl with short hair, Susan, evidenced an astonishing intellect from the age of three. My own children’s distracted minds had become so familiar to me, that I marveled when I saw the orderly block designs Susan created. Little Susan spoke well, attentively organized her playthings, kicked balls with ease, and even opened her own bananas without squishing them. Suitably, young Susan received a full, rigorous education at our town’s only private school from award-winning teachers. By graduation, Susan had earned honors and scholarships in speech, mathematics, and athletics. She now attends a small liberal arts college hundreds of miles from home and studied a semester in Italy.Outgoing, intelligent, and capable, Susan needed full sun from the very beginning of her life. By contrast, Susan’s big sister Amanda had long hair and a clear singing voice, but she cried easily, worried much, and preferred to play at home. She loved kittens and anything small. We marveled that the two girls were so close in age, yet so different. As a teen, Amanda had migraines, unexplained stomach aches, and social fears that kept her parents linked to their phones waiting for her anxious calls. While her sister Susan thrived in the demanding and highly social private high school, Amanda wilted. The girls’ parents chased doctor appointments and medications, and they finally decided to bring her home. Amanda began sleeping at night again. Her parents insisted on a strong education at home but allowed Amanda time to rest, read, and play with her favorite cats. Removed from the intensity of her private school, Amanda slowly regained her strength, color, and vitality. She graduated a year after her peers, attended a small college near home, and this past summer began teaching music and theater to young children. Children warmed to her, and she to them. Far into October that year long ago, those backyard flowers grew into bushes of color with bright pinks and rich reds. Still delicate, they would never thrive in the bright heat of our front porch. I knew this now with certainty. I still remember that day. When I carried those tender, shriveled flowers to our backyard, the metaphors spoke to me in a sudden and deeply personal way. The flowers needed shade. I could not change that. My growing understanding of my children’s needs brought silent emotion as I made my way to the backyard. Yet somehow the understanding also brought a glimmer of contentment. 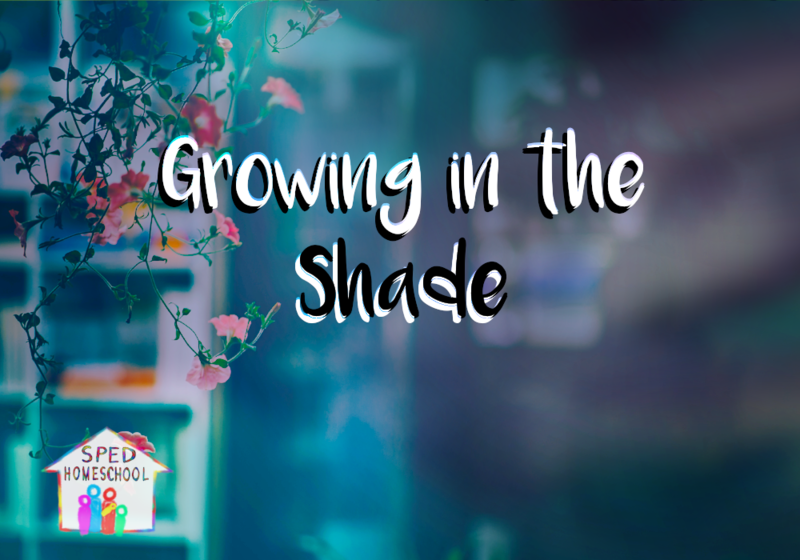 I did not fully understand the implications, but I began to accept the truth: Some children grow best in the shade. Reprinted with permission from Memoria Press. Originally published in Simply Classical Journal Winter 2018 edition.